A lovely selection of antique and Victorian brooches, mouring pins, antique branch coral, Etruscan revival, stick pins, cameos and bar pins in sterling silver, gold fill, 10k and 14k. 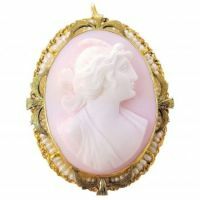 All our brooches and pins are affordable and in reach to collectors and lovers of 'old' jewelry. 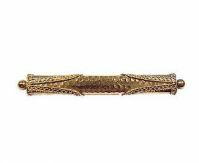 Antique pins are in an abundant supply and are great pieces to start your collections with. Circa early 1900's. 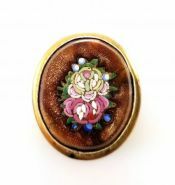 An antique goldstone mounted on a silver plated filigree brooch. Simply lovely! Circa 1900's. Antique goldstone roses mosaic in a rolled gold frame. Can be worn as a pin or pendant. An antique Fleur de lis brooch with hook. 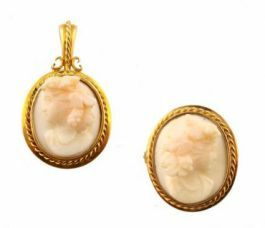 Can be worn as an accent pin or as a chatelaine holder for a watch, pendant or locket. Circa 1850's. 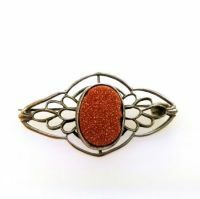 10k yellow gold button shaped Coral stick pin. Circa 1860's. 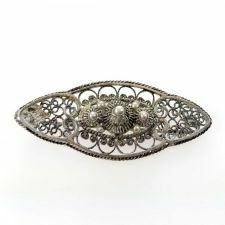 10k Victorian Etruscan Revival brooch with hand hammered details and delicate Etruscan wire twist decoration. Circa 1890's. 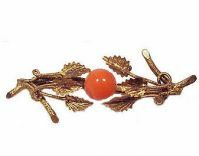 Yellow gold filled branch with foliage brooch that has a button shaped coral center. Circa 1860's. 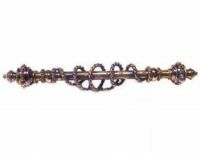 Victorian Etruscan Revival bar pin.